Vilhelm Hammershøi, a Dutch genre painter in the 19th century, was born on May 15, 1864 in Copenhagen, Denmark. He’s a painter who made a distinct mark by using mainly muted tones and colors, principally gray and blue in his interiors, turning them into very quiet scenes. The quietness of the rooms were further amplified by the minimal furnishings. While Hammershøi was a Symbolism exponent, it had been argued that his main focus was to portray the beautiful aspects of being ordinary instead of trying to create statements that were profound. His works have a timeless and mystical quality about them, yet allowed the viewers to have a nostalgic trip into days gone by. According to Emil Nolde, a German artist, Hammershøi was a reserved person in life, just like his art. His tonal variations and composition showed the influence of Jan Vermeer, a famed Dutch realist genre painter. He was also influenced by James Abbott McNeill Whistler, a Post-Impressionist painter from the United States. His most familiar sitter was his wife, whom he painted within the rooms in their very neat apartment. Hammershøi is now being recognized as one of Scandinavia’s best genre painter, following the current revival of interest on his works. His first art teacher was philosopher and artist Niels Christian Kierkegaard before he was tutored in painting by romantic landscape artist Peter Vilhelm Carl Kyhn, a Danish Etchers Union founding member. He was an artist who encouraged his students to anchor their study of art and painting on plein air and using life models, as well as depicting landscape with naturalism. Later, Hammershøi studied at the Royal Danish Academy of Fine Arts and at the Independent Study School, where he was taught by P.S. Kroyer, a Norwegian-Danish painter and the leader (unofficially) of the Skagen Painters. James Abbott McNeill Whistler was one of the influencers of the style of Hammershøi when he was younger. Whistler’s works showed the post-Impressionism style characterized by melancholic and nostalgic painting with harmonious yet muted colors. 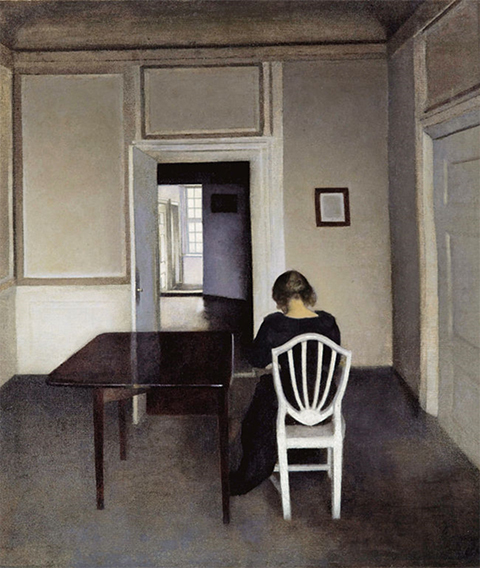 Later Hammershøi was inspired by Pieter de Hooch, Adriaen van Ostade and Samuel van Hoogstraten, all of them painters of interiors belonging to the group of famous Dutch Realist painters of the 17th century. 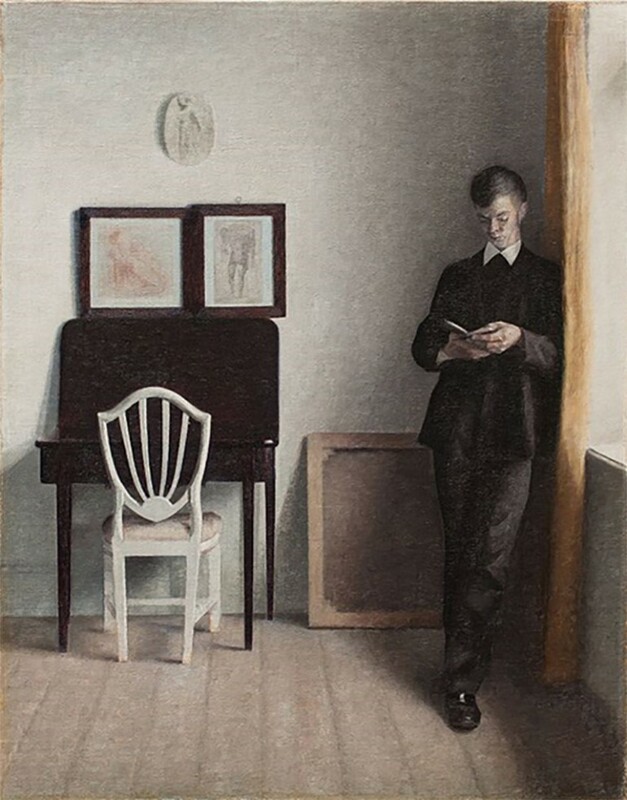 Hammershøi was engrossed in the effects of light shining through windows into empty rooms, and loved partially opened doors that showed an inner space that the viewers were not invited to see. Hammershøi was almost a recluse and his apartment was a continuous still life study for him. He tended to work slowly, working on details meticulously and carefully added light effects and color tones. His works had this sense of stillness just like Vermeer’s “Woman Reading a Letter” while his very limited palette of black, blues and grays were like that of “Nocturnes,” a painting by Whistler. While these painters did work with a narrative, Hammershøi’s works were almost devoid of emotion. His only aim was to show the effect of light on the figure in the room or the room itself, if a human element is not present. While he also did outdoor paintings for his landscapes, he chose to depict buildings and empty streets, particularly during winter. One of his most notable landscapes was “Landscape from Lerje” that used brighter and softer colors in greens, blues and whites.